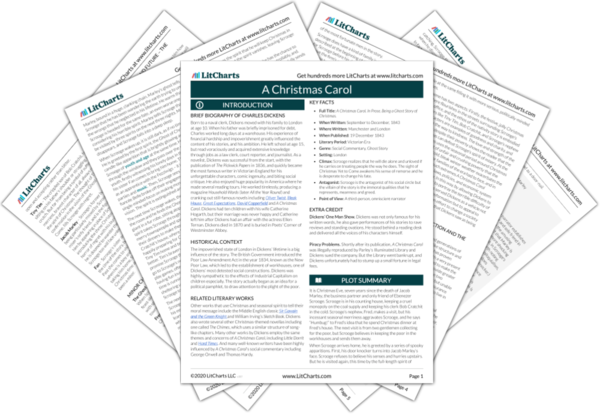 Welcome to the LitCharts study guide on Charles Dickens's A Christmas Carol. Created by the original team behind SparkNotes, LitCharts are the world's best literature guides. A concise biography of Charles Dickens plus historical and literary context for A Christmas Carol. A quick-reference summary: A Christmas Carol on a single page. In-depth summary and analysis of every chapter of A Christmas Carol. Visual theme-tracking, too. Explanations, analysis, and visualizations of A Christmas Carol's themes. A Christmas Carol's important quotes, sortable by theme, character, or chapter. 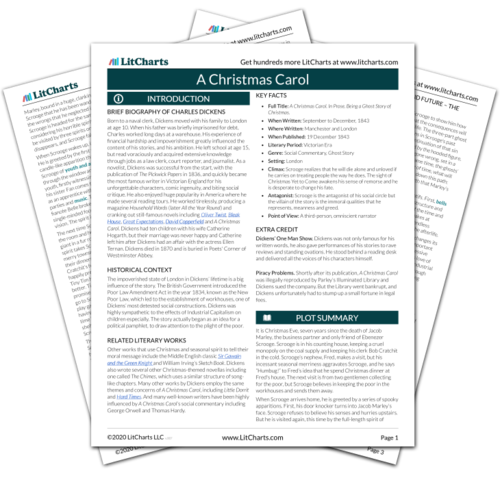 Description, analysis, and timelines for A Christmas Carol's characters. Explanations of A Christmas Carol's symbols, and tracking of where they appear. An interactive data visualization of A Christmas Carol's plot and themes. Born to a naval clerk, Dickens moved with his family to London at age 10. When his father was briefly imprisoned for debt, Charles worked long days at a warehouse. His experience of financial hardship and impoverishment greatly influenced the content of his stories, and his ambition. He left school at age 15, but read voraciously and acquired extensive knowledge through jobs as a law clerk, court reporter, and journalist. As a novelist, Dickens was successful from the start, with the publication of The Pickwick Papers in 1836, and quickly became the most famous writer in Victorian England for his unforgettable characters, comic ingenuity, and biting social critique. He also enjoyed huge popularity in America where he made several reading tours. He worked tirelessly, producing a magazine Household Words (later All the Year Round) and cranking out still-famous novels including Oliver Twist, Bleak House, Great Expectations, David Copperfield and A Christmas Carol. Dickens had ten children with his wife Catherine Hogarth, but their marriage was never happy and Catherine left him after Dickens had an affair with the actress Ellen Ternan. Dickens died in 1870 and is buried in Poets' Corner of Westminster Abbey. The impoverished state of London in Dickens’ lifetime is a big influence of the story. The British Government introduced the Poor Law Amendment Act in the year 1834, known as the New Poor Law, which led to the establishment of workhouses, one of Dickens’ most detested social constructions. Dickens was highly sympathetic to the effects of Industrial Capitalism on children especially. The story actually began as an idea for a political pamphlet, to draw attention to the plight of the poor. Other works that use Christmas and seasonal spirit to tell their moral message include the Middle English classic Sir Gawain and the Green Knight and William Irving’s Sketch Book. Dickens also wrote several other Christmas-themed novellas including one called The Chimes, which uses a similar structure of song-like chapters. Many other works by Dickens employ the same themes and concerns of A Christmas Carol, including Little Dorrit and Hard Times. And many well-known writers have been highly influenced by A Christmas Carol’s social commentary including George Orwell and Thomas Hardy. Full Title: A Christmas Carol. In Prose. Being a Ghost Story of Christmas. Climax: Scrooge realizes that he will die alone and unloved if he carries on treating people the way he does. The sight of Christmas Yet to Come awakens his sense of remorse and he is desperate to change his fate. Antagonist: Scrooge is the antagonist of his social circle but the villain of the story is the immoral qualities that he represents, meanness and greed. Dickens’ One Man Show. Dickens was not only famous for his written words, he also gave performances of his stories to rave reviews and standing ovations. He stood behind a reading desk and delivered all the voices of his characters himself. Piracy Problems. Shortly after its publication, A Christmas Carol was illegally reproduced by Parley’s Illuminated Library and Dickens sued the company. But the Library went bankrupt, and Dickens unfortunately had to stump up a small fortune in legal fees. Parfitt, Georgina. "A Christmas Carol." LitCharts. LitCharts LLC, 8 Nov 2013. Web. 23 Apr 2019. Parfitt, Georgina. "A Christmas Carol." LitCharts LLC, November 8, 2013. Retrieved April 23, 2019. https://www.litcharts.com/lit/a-christmas-carol.